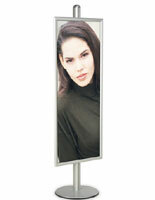 This grip frame vertical display stand uses snap frames for quick image change outs. These grip frames hold two vertical retail posters on a handsome aluminum display stand. 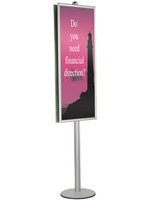 Part of the classy FORTE display series, these banner stands make a stunning display. 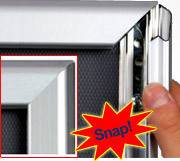 The unique snap frames present the popular new grip design. This is the easiest display equipment you'll ever buy; simply open the 4 grip sides and load your poster, then close them. Your poster is held in place with the frame's grip sides. Position your grip frame at the ideal height for your display with the pole's adjustable track. Grip frames and snap frames are perfect for all types of displays. 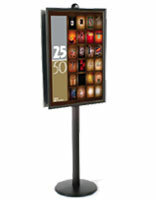 Use them on the show room floor in your store to showcase retail posters, or bring them to your next trade show exhibit. 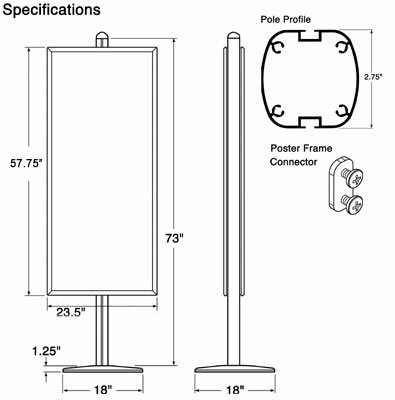 The metal snap frames, better known as grip frames sit on an 6ft' pole and feature two back-to-back display holders to beautifully exhibit your posters. 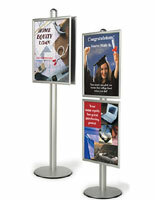 Buy these double-sided grip frames to display in your store and advertise multiple sales at once! 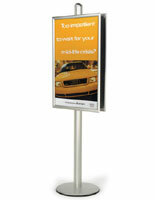 A large 22" x 56" vertical grip frame, also known as a snap frame product are simply stunning on this poster stand. These sturdy displays will last so long, you won't even think about purchasing other types of display holders. Grip frames are such a superior product; they make other display equipment obsolete. 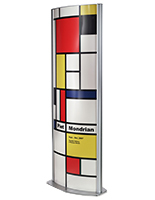 Grip Frames: (2) 22" x 56"
Viewable area: (2) 21" x 55"